Holy moly, I'm a blogging freak! Granted, I'm writing up all of these posts in one day, so that's why you're getting a bunch in one week. ANYWAY. Anyway. Remember that one time I told you I was going to do a sort of "series" on how to make your pre-pregnancy clothes last longer? Well, I have pictures on my phone that I don't think I will EVER make it through, so I'm gonna throw some at you now. First, we have the little black dress. Recognize this one? No? Well, I wore it here. Let me begin by saying this: Not all LBD's will work with a pregnant belly (duh?). Mine is a flowy cotton (wonderful, wonderful cotton) with an empire waist. 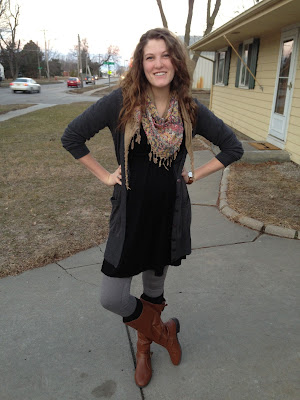 Pop on some leggings, add a scarf, sweater, and boots, and VOILA! Perfect pregnancy outfit. Second, we have any pregnant woman's best friend - the maxi. If you don't recognize this one, it's the one I made and wore here. Super easy to make - takes about 30 minutes, and I highly recommend it. ANYWAY. Pop on a belt with that sucker to emphasize your growing belly, and you will get all sorts of compliments. A maxi dress can work for you up until the end, my friends. So. Dresses. YAY!!! 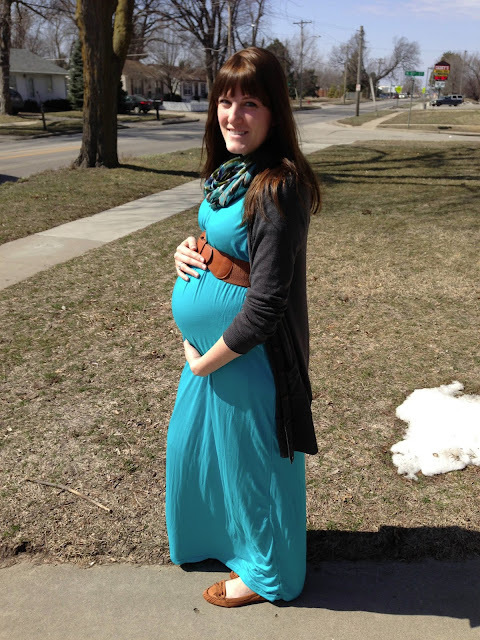 Let me tell you what, people - dresses can (and should) be your best friends throughout your pregnancy. Whether it's the middle of summer or the dead of winter, you can wear a dress! In the winter, just add a pair of maternity leggings (like I said, the only necessary maternity clothing item) and some boots, and you are good to go! I love both outfits- flattering, stylish and comfortable. I can't believe you made that dress- good work! Dresses and I have been BFFs through this pregnancy. I should have invested in those maternity leggings though. Oh well, I refuse to now that I'm only 45-ish days out! You have wonderful maternity style! 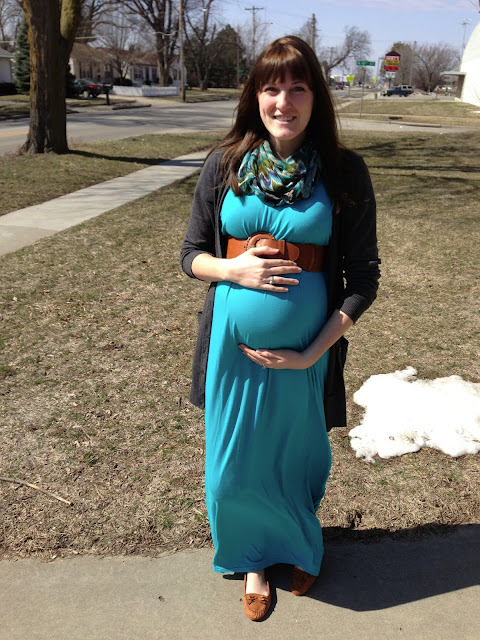 I have a feeling when I decide to have a baby I will be wearing LOTS of dresses. Love both of the dresses! And your hair is fab!!! I still love the dress you made. It's a great color on you too. The only other necessity I'd say is maternity shorts, if you're gonna be preggo throughout the summer, which you don't have to worry about. I LIVED in maxis, Target tank tops and shorts. You really are on a roll this week! I love it! I've missed reading about you! Is that a patch of snow behind you? That's about the amount of snow we got this entire winter. Boooo. Also, your hair is amazing. I am all about dresses! And skirts! 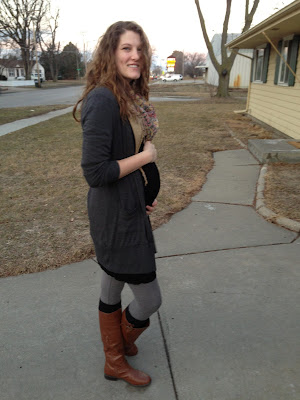 So much more comfortable than pants.. even maternity pants! Oh man. The dresses look amazing on you! stop it why are you so cute! i love both outfits, you look adorable!! that scarf in the first one is really cute! I love that all of these outfits are also good for people like me...who aren't pregnant but like to eat a lot of food in one sitting. You look absolutely adorably beautiful. Dresses are always my answer. Today I wore a maxi for the sole reason that I just didn't feel like wearing clothes. you are SO cute. i am planning on wearing a lot of dresses this summer- especially since ill be good and big in the hot georgia heat... the less tight clothing, the better. Hot cha cha!!! Work it! Love the boots and that maxi is super cute! I may have to try making one myself! 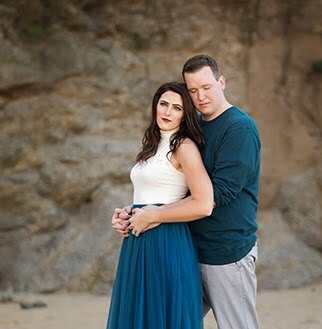 I'll be honest.... my husbands sweats were my best friend at the end of my pregnancy :) Are you seriously not wearing maternity clothes yet? And I love seeing all of your instas! I can't believe how quickly your pregnancy has flown by! Agh, I'm catching up on your blog but having a fun time seeing your pictures on Instagram - that baby bump sure is growin!